Blowout SALE - Order one DVD or all of the DVDs on this page at the super low price of just 5 FRNs each. This offer applies to the DVDs on this page only. Its no longer safe to breathe the air, eat the food, or drink the water. The people of this Planet are being deliberately poisoned by a Criminal Cabal, whose goal it is to own the World, everything, and everyone in it. They know that the majority of the population is arrogant, ignorant, & apathetic - or dont give a damn. The people have become like puppets & pawns. They will be sacrificed when necessary. This Evilarchy makes nothing but Death, Debt & Disease. They create our Currency & our Commerce through the privately owned Federal Reserve, the IMF & the World Bank. They are ideologically evil, have no conscience, and retain no remorse. They are Illuminists. They are Luciferian. These Manthusian-Minded Men are cold-blooded killers. They seek a Global Government, through the United Nations & the establishment of a New World Order. They are out-Hitler-ing Hitler & out-murdering Mao. HAARP has replaced the Hydrogen Bomb. Its their newest Weapon of Mass Destruction  and its silent. They can develop Tornados, directionalize Hurricanes, trigger Earthquakes, and subsequent Tsunamis at will. Their Frankenstein-like Scientists are no less monstrous than Dr. Josep Mengele. 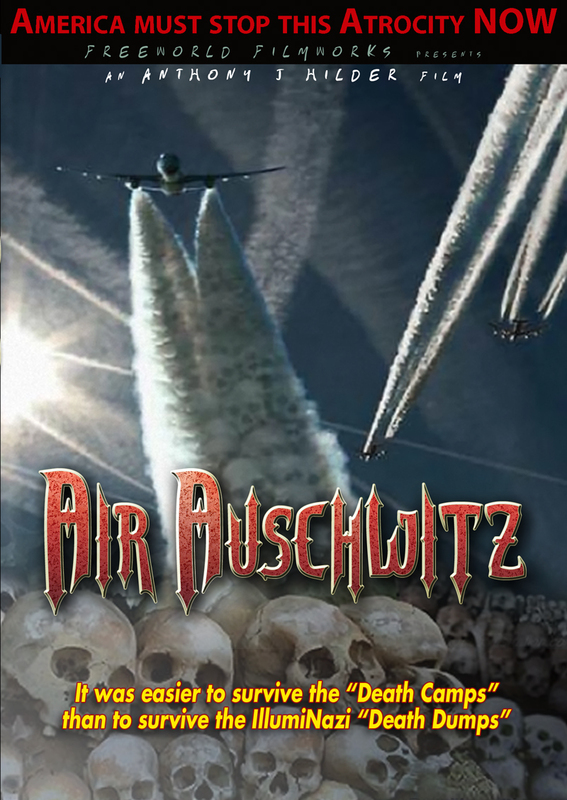 They drop poisoned particulates directly upon the innocence of the World to create Alzheimers, Autism, Fibromayalga, Morgellons, and the variety of Cancers. The DEATH DUMPS that they flush daily from their Toxic Toilets overhead kill the fish, the birds, the mammals, the plants, and trees upon the Planet. The end-goal for the Illuminati is to radically reduce the population of the Planet. Their intention is to kill 9 out 10 people now living within a decade. They consider most of you, your family, and friends USELESS EATERS & EXPENDABLE! For freedom, life, and liberty to live  this Evilarchy must die. The survival of Mother Earth leaves no other Option. Lucifer is God! That is what General Albert Pike, author of Morals & Dogma and the Masonic Bible, and co-founder of the Ku Klux Klan boasted. Pike declared, the higher initiates of the Masonic Religion should follow the Luciferian doctrine. This Satanic cult has spread like a cancer across America & England under the mask of moderation and cloak of civility. 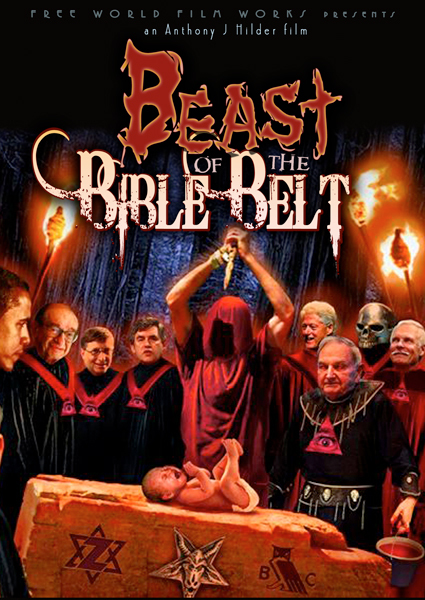 Ted L. Gunderson, former head of the FBI in Dallas, Memphis and Los Angeles joins William David Cox, star of Skull and Bones - The Catholic Connection, in this full-blown exposé of the Evilarchy that works within Americas Heartland and our Christian Bible Belt. These Faustian Financial Fraternities, which lurk in the shadows like vampires, have sucked the life-blood of our nations. They create our currency and control our commerce. The privately owned Federal Reserve & the Bank of England MUST be destroyed. For freedom to live, their Satanic system must die. But first, the political pimps, prostitutes and parasites along the Patomic and in Parliament must be exposed. Ted Gunderson, William David Cox and myself are dedicated to bringing freedom to the peoples of this planet. A world that is free is not united, a world united is not free. A film can reach the world before a book can be read by one. The Illuminatis managed media and propaganda press are no longer able to sell the lie. With your help we will incite a revelation! After watching Anthony J. Hilder dissect Bush Gang's spin story of 911, you'll discover who the REAL monsters are behind the incredulous NYC attack. Learn of the Grand Scheme authored by the Cashist Cartel that controls America 's currency and commerce through the privately owned Federal Reserve...and the American Illuminati. 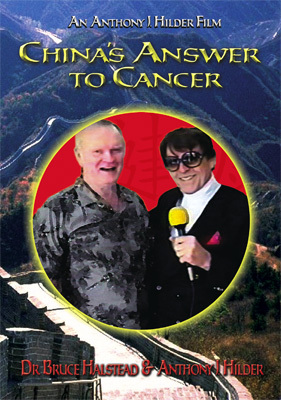 This 9:11 DVD includes more than 2 whopping hours of shocking revelations the only way Hilder knows how to present it, with uncanny genius. Watch exclusive interviews with Lyndon Larouche, Jim Marrs, , Dr. Stanley Monteith, Michael Tsarion, Eric Hufschmid and many more. 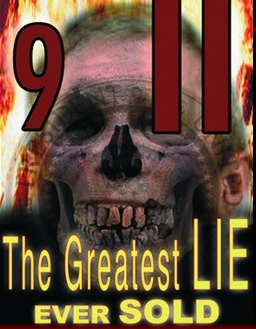 This DVD is a definite must if you want to get the inside story behind the Bush Illuminati New World Order Agenda. The story contains priceless bits and pieces of the puzzle that make up "THE BIG PICTURE." Anthony J Hilder provides overwhelming evidence, that America 's Illuminati oversees the Alien Agenda at Area 51. 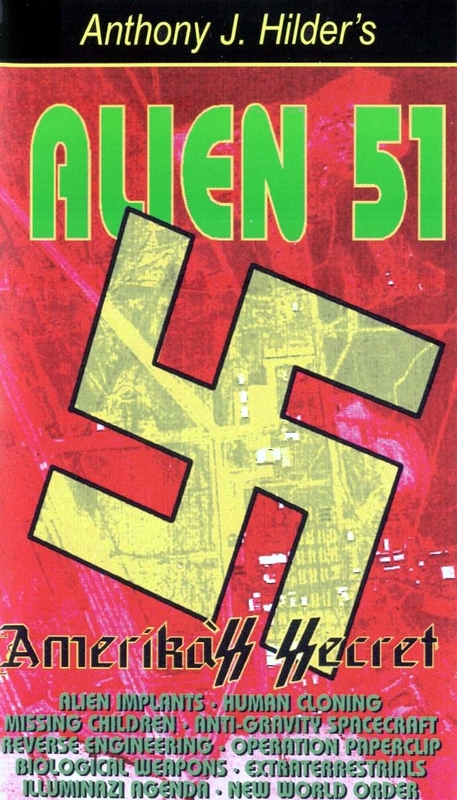 This once Top-Secret base hidden in the heart of the Nevada 3 million acre Nellis Test Range is home to a host of Hitlerian Horrors spawned by the same Nazi scientists who built our missile program. Not far from the labyrinth of underground tunnels and Frankenstein Factories where medical experiments have been performed on human beings is Yucca Flats where the First Atomic Bomb was tested. It wasn't long after the test that the Cashist Cartel that controls America 's politics unleashed the nuclear nightmare on Japan after they had offered conditional surrender. Their goal was to frighten the world into demanding a Global Government. Alien 51 validates that the anti-gravitational flying disks seen around the Groom and Papoose Lake facilities are meant to appear as extraterrestrial. Are they? Has an alliance been struck with Alien beings? On this explosive tape, David Adair, an eminent aerospace scientist, tells of examining an alien propulsion system at Area 51. Dr. Roger Leir describes how he surgically removed Alien implants from 9 abductees. Jordan Maxwell, Paul Tice and Norio Haykawa bear witness to the existence of alien crafts. You won't see this on the nightly network news. This is a must see for all who seek the truth. 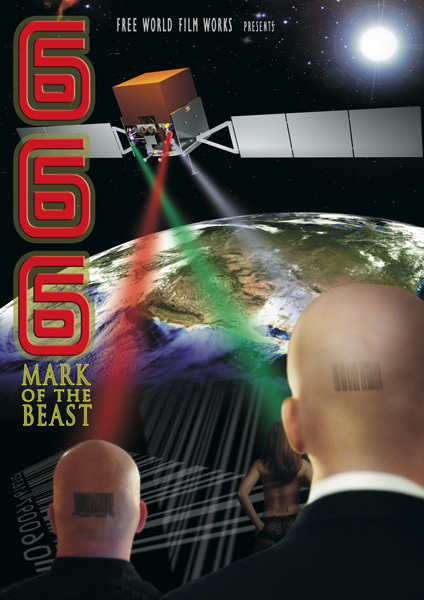 This dynamic documentary serves as irrefutable evidence that the Warlords of Wall Street & Washington have now devised a way to "inject" every individual on the planet with their "MARK OF THE BEAST". This diabolical plan is being proposed under the guise of offering "great benefits to mankind" such as doing away with robbery by doing away with cash; secondly, offering a National Health Program that would give doctors and their patients a "per- manent medical record" affixed on an implanted bio-chip in the back of the right hand; thirdly, doing away with illegal drugs by doing away with "illegal cash" and finally, stopping "illegal employment" by identifying all citizens seeking work. Hillary Clinton's proposed "MANDATORY" vac- cination program for all children -- before they could enter government-controlled schools -- could well be the "covert" vehicle used to "justify the injection of the 666 MARK. Far more sophisticated than Adolf Hitler's "tattooing" of all Gypsies and Jews, Hillary's proposal, if passed, could nail all citizens with a permanent ID number. And any "disease" or "drug" they deem necessary to pacify the public to accept a NEW WORLD ORDER. Those who "control" the US Space Program have already installed a "GRID SYSTEM" through the NASA satellite program and are now "tracking people and vehicles" from space stations. Unbeknownst to the average American, the US military is already using "transponders" that are injected into the arms of US military personnel. As it was in Hitler's Germany, so it will be in Obama's America. HL Mencken once said, "One can never underestimate the intelligence of the American people." But even those with "limited intellect" can determine that "the system" being developed "for them" is not only Satanic, but would, IF ALLOWED TO BE INSTALLED, create a virtual HELL ON EARTH. As we rush towards Millennium 2000 the fanatical forces of financial fascism are fast at work in their attempt to bring about a global government -- through the United Nations. The Cashist Cartel that controls america's commerce and currency intends to kill, control or incarcerate all opposition to their oligarchy of evil by the turn of the century. Their goal is a New World Order. Our goal is a free world. Knowing that those who do not learn from history are bound to repeat it -- the Eastern Evilarchy has dedicated itself to keeping our people deaf, dumd and ignorant to the imperative life and death issues of the day. It is both obvious and in evidence that more Federally engineered atrocities like the Oklahoma bombing are on the way -- they've scheduled a massive stock market crash to cripple us financially -- and a series of white/black racial confrontations to justify FEMA and UN intervention -- all of which is intended to psychologically "set-up" martial law and foreign intervention. The stench of death and treason fills the air. agencies resulting in four years of torture and imprisonment. In The New World Odor Hansen and Hilder document the "devastation by design" which has befallen America over the past half century. Their "foresight" as to what the future holds is based upon their very accurate historical hindsight -- as to the way things really were -- not as we were led to believe. Hansen and Hilder play hardball. They're both heavy hitters and have hit a home run with bases loaded with The New World Odor. It's a stinking good video that needs immediate and massive exposure. 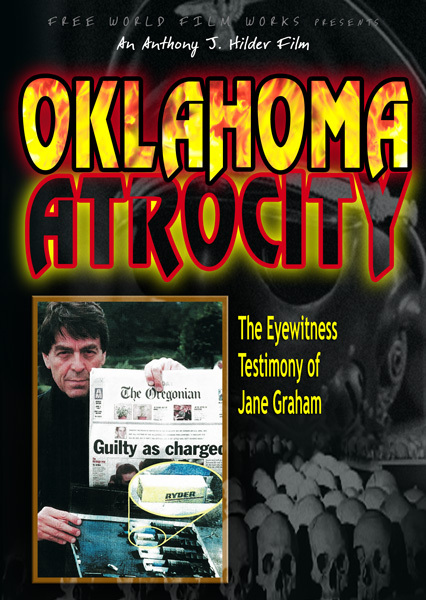 There is no way you can watch Jane Graham's testimony here and draw the conclusion that Federal agents weren't involved in blowing up the Fed's building in Oklahoma City and covering their crime. Did Clinton's terrorist team mass-murder 168 innocents to pass the anti-Bill Of Rights bill -- which gave massive powers to the President and police? The body count around this "crime of the century" is still rising as key witnesses, like Terry Yeakey, are "eliminated" before they can identify the state-sponsored terrorists. Is Timothy McVeigh a Manchurian candidate "programmed" to kill on command and then quietly accept his fate? Has a "control" transponder been implanted in his body as he's claimed? What about the dozens of news broadcasts that initially reported the discovery of several un-exploded bombs in the building? Hear Jane Graham, Head of the HUD Employees Union, saying she encountered three suspicious-looking men in the parking structure the Friday before the explosion, who had plans to the building, and what looked like plastic explosives? Hear Jane tell of the "TWO BOMBS" that went off. See the yellow Ryder truck hidden in the government compound at Fort Gruber in eastern Oklahoma before the explosion. If the criminals who are responsible for this atrocity are not brought to trial, we are convinced that provocateurs of the Eastern Evilarchy will soon strike again. The comparison between Nazi Germany in the mid 30s under Adolf Hitler and America in the mid 90s under Bill Clinton is frightening. Hitler gained control over Germany after his agents set the Reichstag (German congress) on fire. Hitler was successful in blaming his opposition as the culprits. Clinton is attempting to accomplish the same thing with the Oklahoma bombing. Hitler and Clinton both sought police state power. Hitler got it. But will Clinton get it? All conservatives, Christian, Black Muslims, legitimate liberals and patriots are being targeted as potential terrorists. In short, all opposition to Clinton and the Cashist Cartel is under the gun of the Money Mafia's 'managed media'. 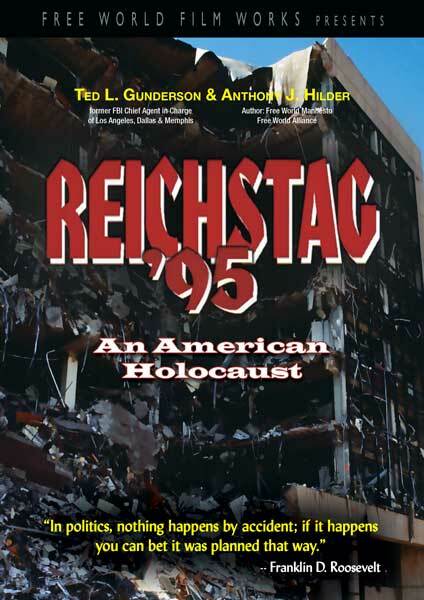 Ted Gunderson, former Special Agent in Charge of the FBI in Los Angeles, Dallas and Memphis, discloses his insight into who's really behind the Oklahoma bombing. His conclusions, based on 27 years with the bureau, will shock you! Could the explosions have been set by "agents" of the International Cashist Cartel that seeks to abolish the American Constitution and establish a New World Order? Is Timothy McVeigh another Lee Harvey Oswald? Was he programmed under the CIA's Project Monarch "mind control program" to infiltrate patriotic organizations in order to label them as terrorists? Bill Cooper, Constitution Party Chairman and author of Behold A Pale Horse, adds strong commentary supporting the two bomb scenario. Cooper's special insight and military expertise is included, along with comments and questions from skeptical Americans who think the Cashist Cartel concocted fertilizer bomb story is liberally laced with lies... and has a special political agenda. 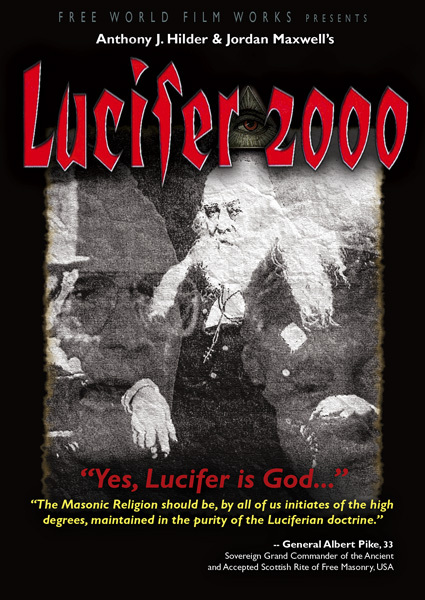 Lucifer 2000, Anthony J. Hilder & Jordan Maxwell's first film, is an "overview" of the American Illuminati's plan to bring this planet under the dictates of gargantuan Global Government by the turn of the century. 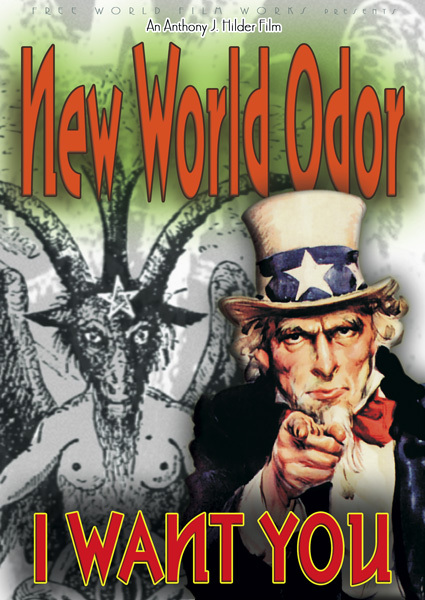 Anthony J. Hilder, who produced the first recorded history of the Illuminati in 1967 (narrated by Myron C. Fagan), joins the eminent occult researcher, Jordan Maxwell, in this exposé of the Evilarchy that now runs Corporate America. Maxwell, who is featured with Hilder on Ancient Mysteries of the World (CBS), strips away the "Masonic Mask" that hides the Satanic Symbols that cryptically cover America capital -- from the Washington Monument to the fasci that border the American flag in the House of Representatives. Together thay pinpoint the political pimps and prostitutes along the Potomac who have raped, robbed and ravaged this republic since its inception. Lucifer 2000 gives the viewer an "IMMEDIATE UNDERSTANDING" of the Illuminati's "Orwellian objectives" in this 1-hour implosive exposé. It presents the "BIG POLITICAL PICTURE" in America today. This vital video hits with punch, power and pizzazz, and has been described as "a tremendous tool in the war to topple America's faustian financial fraternity." Hilder and Maxwell reveal the ancient religious order behind the International Banking Cartel that guides "their group" toward a NEW WORLD ORDER. Together they expose the fact that America essentially operates under a One Party System. The proof of which was evidenced in the passage of the NAFTA (North American Free Trade Agreement) when "sellouts" from both the Democratic and Republican parties joined President Clinton and his BILLIONAIRE BACKERS to "foreclose" on the fortunes of American families, farms and factories. This oligarchy of evil remains in positions of control regardless of which political party is "reputed" to be in power. Hilder and Maxwell document that "key operatives" from the Council on Foreign Relations, the Trilateral Commission, the privately owned Federal Reserve and the Skull & Bones (Faustian Fraternity) do, in fact, direct "the show" that mesmerizes millions by way of the nightly "Novacaine News". Their "political play" is then "reviewed and sanitized" for the American public through "their" well-orchestrated "Managed Media"... to control the mindset of America. Is there a cure for cancer? Is there something out there the American Cancer Cartel is NOT telling us? Or, something the Pharmaceutical Cartel  aka Big Pharma, has no interest in because it's not profitable? Dr. Bruce Halstead leads the team of highly trained medical professionals to China to investigate the hard evidence surrounding the exotic Elixir from Manchuria called Tien Hsien. Rumor has it that the Elixir cured cancer. New Book - "Big Brother Is Watching You" - Click here. This book shows that Big Brothers New World Order is rapidly approaching. It reveals the technolofies Big Brother is using to watch your every move, listen to everything you say and hear, track what you buy and track your movements on the Internet. This book also shows you what you can do to stop Big Brother! We carry used books on politics, religion, health and other subjects.